Hey guys i'm curious as to how exactly you go about dropping the subframe from those of you that are familiar doing it. Obviously all of the bolts found underneath it have to be removed but what other not so obvious steps are needed to be taken? Does the steering need to be diconnected and if so what part of it, the joint found just above the rack in the engine bay? The easiest part of the steering to disconnect is the joint (steering column side) inside the car, the entire boot and joint itself will drop with the subframe. The nice thing about doing it there is the joint and shaft are indexed, so you cant really put it back together incorrectly. Unbolt the strut at the knuckle and the swaybar endlink, the A arms, brakes and axles will come down with the subframe. I just pull it all at once. I don't mean to bring back a 2 year old thread but I'm going to be replacing my subframe in the next few weeks and wouldn't mind some pointers with removing the old one. Just to make sure I'm understanding this correctly (my car is in storage so I can't take a look until the weekend), I disconnect the column from the rack from the inside of the car? Correct. There's a plastic shroud over the joint area, partially covered by the carpet. I would recommend marking the joint before taking it apart as it's hard to get under the dash to access it. You should also secure the steering wheel with the seatbelt to prevent the clockspring from being damaged if the steering wheel rotates while the rack is disconnected. Are you planning to replace the control arms as well or just the subframe? My commiserations mate. Just had to do some major work on mine after a nasty slip. Look on the bright side, being a southern vehicle the rust probably won't be all that bad. I have no clue in hell how i would get the sub frame or control arms out of my car with all the salt they put on the roads here in England. Except maybe a cutting torch. Thanks zoidberg, saw your thread about Betty a few days ago. Turned out great! I'm in the parts gathering phase, going to overhaul the entire chassis while I'm at it so that I know I have a solid platform for when I swap the motor later on. After the accident my girlfriend told me to retire the "little car" but the little bugger's been with me since 06 so it has seniority and is going nowhere anytime soon haha! How many miles have you got on your car? 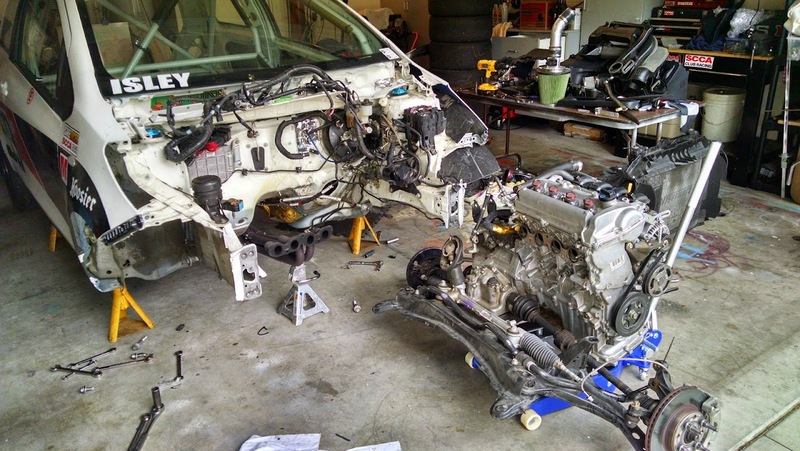 What parts are you planning to replace besides the damaged subframe and radiator support? Are you going aftermarket or staying OEM? You'll have to show us some before and after pictures to see how you've done. These are tough little cars. Plenty of the original crop of 1999 mark 1 Yaris's are still on the road here in the UK even though they are worthless and the rust here is terrible. Your's may well last another 20 years in your neck of the woods. I think mine will last another 8 or 9 years at this rate. I'm at about 130k or so on the car. Swapping inner and outer tie rods, control arms, bushings, both headlights, and I need a new bumper. I went aftermarket on most of the suspension parts, had I known the cost difference was so small I would have gone OEM on everything. Also need to swap my rear torsion beam at some point (has a slight bend that's throwing me off about a degree into negative camber land...also due to highway construction/unavoidable pot hole) but I'll start with the front. I do a lot of highway driving to and from work so I want the car structurally sound again. I'll start a build thread once the work begins. If you have ABS, you need to disconnect the ABS sensors from the hubs. I recall there being some precautions in the repair manual but I don't have them at my fingertips. Sounds like a big project dude. A lot of my bushes are looking perished, but they are ok for the moment. No excessive movement in anything. I think they might well last another few years yet. If i had to replace my front control arms, stabiliser links or tie rods i think i would be tempted to do a total rebuild to save me the hassle later on. Doing struts and front ball joints on a 91 Corolla conjured the concept of full-corner replacement due to difficulty of getting to things to replace separately. (That is, consider adding wheel bearings, drive shafts, strut mounts and maybe brake calipers/rotors to that first job.) Would be nice if Rockauto or Toyota, etc. offered a full-corner kit. Thanks for all the input everyone, luckily I have no snow here and rust isn't usually a problem :) I'm good on brakes as I did them recently before the accident. I'll likely do the wheel bearings, my axles looked good when I was under the car recently on the first attempt at dropping the sub frame. Any specific way to tie the steering wheel with the seat belt? It's just to keep it from turning while removing the subframe, correct?